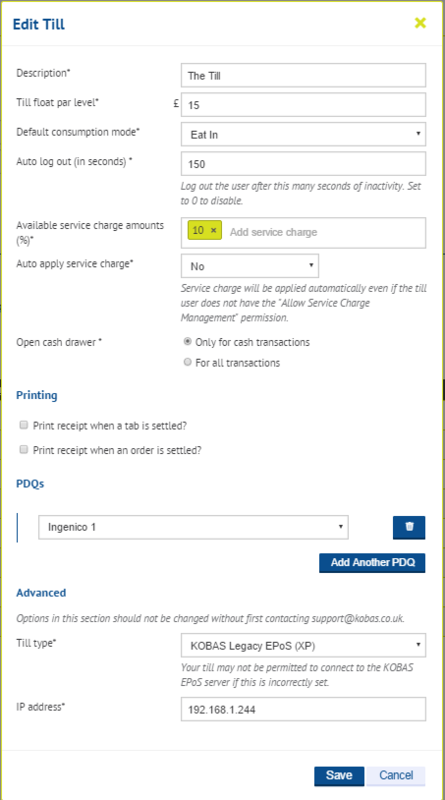 If you have multiple EPoS units in your venue, you may require different configurations for each unit, dependent on the role for which it is intended. For example, you may have a restaurant area which defaults to Eat-In and also automatically applies a service charge. You may also have a takeaway counter in the same venue, which would require a till that defaults to Takeaway and does not apply a service charge automatically. To configure your tills, go to Administration > Venues > and click Venue Details beside the relevant venue. Under the Tills tab, you will see a list of all the tills set up in that particular venue. Each listed till will display it’s individual IP address, Float Par Level, and what model of till it is. Click Edit to make changes. Editing a till’s configuration will allow you to make changes to the way it behaves. Please note that you must have the correct IP address for the till entered on this page in order for your changes to take effect. Contact support if you do not know the IP address for your till and would like to apply custom configuration.